Mary Sue Stephenson Davis of Raleigh, North Carolina, died Saturday evening, October 21, 2017. Visitation will be held on Saturday, October 28, 2017 from 11:00AM to 1:00 PM at Brown-Wynne Funeral Home, 1701 East Millbrook Road, Raleigh, NC 27609. Funeral services will occur at the same location immediately after the visitation, and interment will follow in Raleigh Memorial Park, 7501 Glenwood Ave., Raleigh, NC 27612. A native of Raleigh, Mary Sue was the daughter of Judson and Esther Stephenson. She was a 1955 graduate of Broughton High School. After graduation, she was employed by Insurance of North America, Department of Mathematics at N.C. State University, and C. Y. Hall Court Reporting. 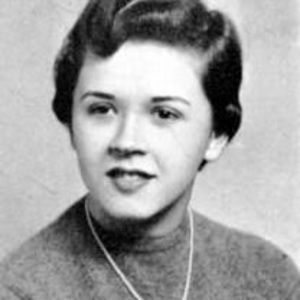 Mary Sue lived with her husband and daughter in Chesapeake, Virginia from 1962 to 1998. There she was a member of Beta Sigma Phi women's service sorority, the Green Meadow Point Garden Club, and volunteered for several women's scholarship programs and in local public schools. She also provided childcare in her home, and became a "second mother" to many young children. Her hobbies included photography, knitting, and collecting Disney memorabilia. In 1998 Mary Sue returned to her beloved hometown of Raleigh to be close to her extended family, and there she enjoyed spending time with her Broughton High School classmates, and caring for her grandsons for many years. Mary Sue was preceded in death in 1962 by her infant son, James Phillip Davis. She is survived by her husband of 59 years, Phillip Davis; daughter, Janice Worden; grandsons John and James; and brother, Jimmy Stephenson. She will be missed by many loving friends and relatives in North Carolina, Virginia, and California. In lieu of flowers, the family requests memorials be made to UNC Lineberger Comprehensive Cancer Center, CB #7295 UNC-CH, Chapel Hill NC 27599-7295.